For my son's birthday, he wanted a Lego cake, because he is 8 and that is what 8 year olds like, apparently. There were definite advantages to this cake, in that it needed to be square, which took a lot of the hard work out of the design. I was also very lucky, because I managed to borrow a little brick mould for the fondant decorations, but I thought I would show you how I made the little Lego men. The cake is far from perfect, as I was struggling with my back at the time, but I imagine if you had more time, you could probably do a better job! The method for creating the figures was actually quite easy, as you will see. I am by no means an expert, so this is very much an idiot's guide, with me as the idiot! But, on the plus side, if I can do it, anyone can! 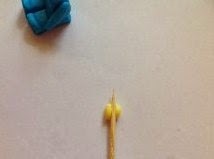 You will need; Some yellow icing, blue icing, a little water, a small clean paintbrush, a cocktail stick, and a little black gel food colouring. I have not been exact with the proportions, as it will depend how big you need him to be. 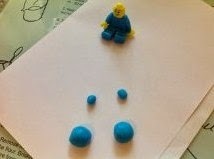 To begin with, you will need four blobs of fondant icing in your chosen colour, two medium and two small. 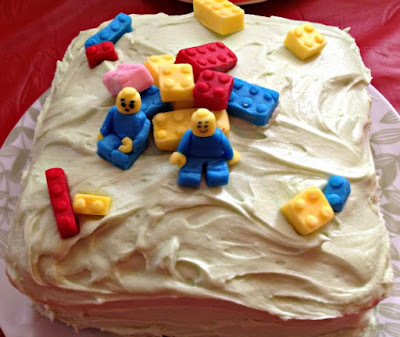 You can buy pre-coloured icing in packs of primary colours relatively cheaply, but if you need a lot, or you are planning future projects, it's easy to dye white icing, which can be purchased in much larger, more economic packs. It's a good idea to use gel food colouring, which comes in tubes, as the bottles of liquid food colouring change the consistency of the icing, making it sticky and hard to work with. 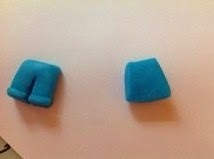 To dye the icing, break off as much as you need, flatten it out a little and make a well in the middle with your finger. Add a few drops of colouring, and fold the sides inwards to cover the drops. This helps to reduce staining of the finger tips and nails! Do this a few times, until the colour starts to mix in, then knead the icing thoroughly until the colour is evenly spread. At this stage, you can add more colour if you are aiming for a darker shade. It's important to add the colour a little at a time and build it up, as a little goes a long way and it's much easier to add than it is to take away! 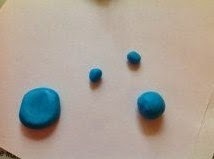 Take one of the larger blobs (that's a technical term!) and flatten it to the width you would like your figure to be. I used an actual Lego character as a guide. Using a sharp knife, slice the edges, so that it tapers slightly towards the top. 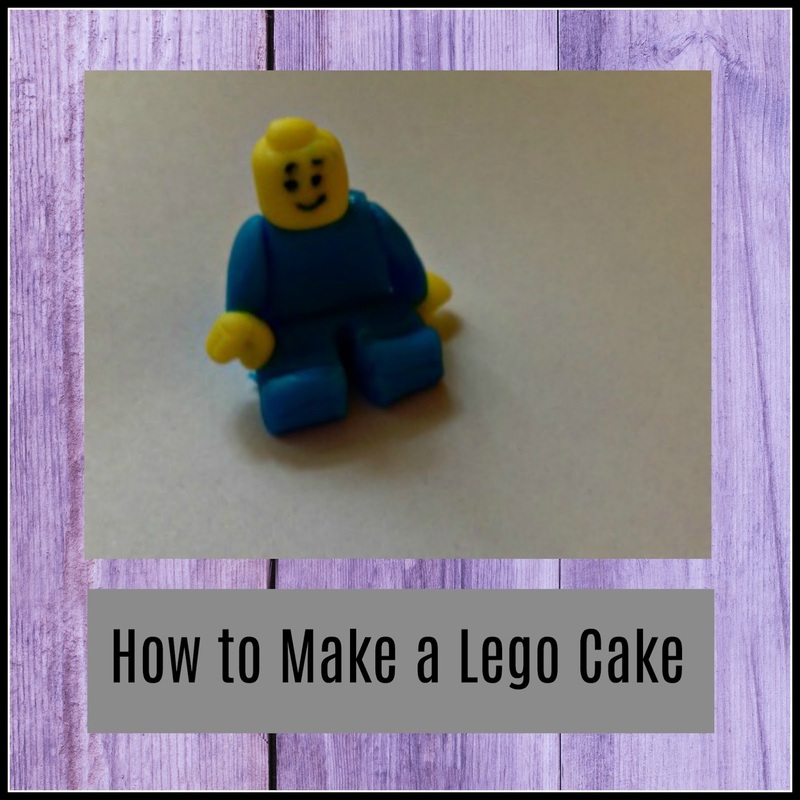 Lego figures are all about the angles and it's worth spending a little extra time getting this bit right, as it gives them their distinctive shape. Use a small, sharp knife, as it will give a much more defined edge. When you've created your slightly triangular shape, make a slit two thirds of the way up in the centre, separating the two sides slightly with your knife. 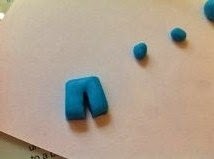 Then, using a tiny piece of fondant, make a little sausage shape and carefully attach to the bottom of one side, then do the same to the other. You may find it easier to use a tiny paintbrush dipped in water to 'glue' the pieces on. Now you've created legs, use the same technique to make the upper body. 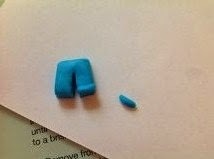 Make this shape more tapered, but ensure the width is the same. 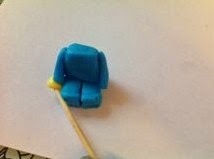 Using your paintbrush and water, attach the body to the legs, as if he is sitting down. The next bit is quite fiddly, but it will work, you may just need a little patience! Roll out your remaining two blobs into sausages, with one end slightly thicker. These will be your arms, so make the length about three quarters of the height of your sitting figure. When you attach these at the shoulder with the water, hold them in place for at least thirty seconds, to give them time to stick. 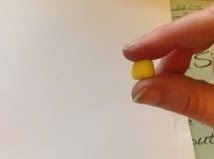 Next, roll a small amount of yellow icing into a ball and, taking a cocktail stick, squish (techy again!) the centre, until it resembles a Lego-y hand. Using the cocktail stick to lift the hand, moisten the end of the arm with water and hold the hand in place for thirty seconds. It helps if you position the hand so it is resting either on the leg, or on the surface, to give it some support. 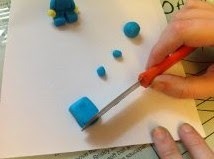 To make the head, grip a small piece of yellow fondant between finger and thumb, and use the finger and thumb of the other hand to roll it gently, creating a squat cylinder shape. 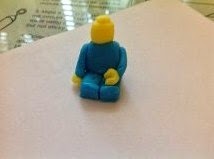 Squash a tiny ball of yellow fondant onto the top, to make the distinctive Lego stud and attach to the body with a little water. All that's left to do now, is paint the face, wich I did using a little gel icing and a cocktail stick. If you are not confident, it helps to make an indentation of the features with the cocktail stick first, as a guide, before going over it with the colour. The great part is, there's no right or wrong design, there are millions of Lego figures available, all with different expressions, so you can't get it wrong! The lego pieces are just awesome!! A really fab cake - love it! How cute! And you made it look easy enough that even I could do it. I'm sharing! Thanks.